Dr. Andrei Dmitrievich Sakharov (Russian: Андре́й Дми́триевич Са́харов) (May 21, 1921 – December 14, 1989), was an eminent Soviet nuclear physicist, dissident and human rights activist. The father of the Soviet hydrogen bomb, he became a foremost advocate of civil liberties and reforms in the Soviet Union. Though his early career was devoted to the creation of the Soviet nuclear program, he later dedicated himself to reforming the Soviet political system. Together with his wife, Yelena Bonner, he became, along with Alexander Solzhenitsyn, one of the regime's most outspoken critics. Sakharov was a key figure in the eyes of the world in challenging the moral authority of the Soviet regime. Two years prior to the demise of the Soviet Union, he was elected a member of the new Russian Duma, or parliament. He demonstrated the moral authority of the individual who stands upon unchanging principles such as truth and justice. 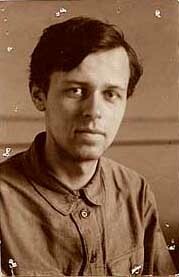 Born in Moscow in 1921, Sakharov entered Moscow State University in 1938. Following evacuation in 1941 during the World War II, he graduated in Aşgabat, in today's Turkmenistan. He was then assigned laboratory work in Ulyanovsk. He returned to Moscow in 1945 to study at the Theoretical Department of Lebedev Physical Institute (FIAN) at the Physical Institute of the Soviet Academy of Sciences. He received his Ph.D. in 1947. Upon World War II's end, Sakharov researched cosmic rays. In mid-1948 he participated in the Soviet atomic bomb project under Igor Kurchatov. The first Soviet atomic device was tested on August 29, 1949. After moving to Sarov in 1950, Sakharov played a key role in the next stage, the development of the hydrogen bomb. The first Soviet fusion device was tested on August 12, 1953, using what was called the Sloika design. In 1953 he received his Doctor of Science degree, was elected a full member of the Soviet Academy of Sciences, and awarded the first of his three “Hero of Socialist Labor” titles. Sakharov continued to work at Sarov, playing a key role in the development of the first megaton-range Soviet hydrogen bomb, using a design known as "Sakharov's Third Idea" in Russia and the Teller-Ulam design in the United States. It was first tested as RDS-37 in 1955. A larger variation of the same design which Sakharov worked on was the 50MT Tsar Bomba of October 1961, which was the most powerful device ever exploded. He also proposed an idea for a controlled nuclear fusion reactor, the tokamak, which is still the basis for the majority of work in the area. Sakharov, in association with Igor Tamm, proposed confining extremely hot ionized plasma by torus shaped magnetic fields for controlling thermonuclear fusion that led to the development of the tokamak device. Sakharov proposed the idea of induced gravity as an alternative theory of quantum gravity. From the late 1950s, Sakharov had become concerned about the moral and political implications of his work. Politically active during the 1960s, Sakharov was against nuclear proliferation. Pushing for the end of atmospheric tests, he played a role in the 1963 Partial Test Ban Treaty, signed in Moscow. In 1965 he returned to fundamental science and began working on cosmology but continued to oppose political discrimination. The major turn in Sakharov’s political evolution started in 1967, when anti-ballistic missile defense became a key issue in U.S.–Soviet relations. In a secret detailed letter to the Soviet leadership dated July 21, 1967, Sakharov explained the need to "take the Americans at their word" and accept their proposal "for a bilateral rejection by the USA and the Soviet Union of the development of anti-ballistic missile defense," because otherwise an arms race in this new technology would increase the likelihood of nuclear war. He also asked permission to publish his manuscript (which accompanied the letter) in a newspaper to explain the dangers posed by this kind of defense. The government ignored his letter and refused to let him initiate a public discussion of ABM in the Soviet press. In May 1968 he completed an essay, Reflections on Progress, Peaceful Coexistence, and Intellectual Freedom, in which anti-ballistic missile defense is featured as a major threat in instigating nuclear war. After this essay was circulated in samizdat and then published outside the Soviet Union, Sakharov was banned from all military-related research and he returned to FIAN to study fundamental theoretical physics. In 1970 he was one of the founders of the Moscow Human Rights Committee and came under increasing pressure from the regime. He married a fellow human rights activist, Yelena Bonner, in 1972. In 1973 he was nominated for the Nobel Peace Prize and in 1974 was awarded the Prix mondial Cino Del Duca. He won the Nobel Peace Prize in 1975, although he was not allowed to leave the Soviet Union to collect it. His wife Yelena Bonner read his speech at the acceptance ceremony. Sakharov's ideas on social development led him to put forward the principle of human rights as a new basis of all politics. In his works he declared that "the principle 'what is not prohibited is allowed' should be understood literally," denying the importance and validity of all moral or cultural norms not codified in the laws. He was arrested on January 22, 1980, following his public protests against the Soviet invasion of Afghanistan in 1979 and was sent to internal exile in Gorky, now Nizhny Novgorod, a closed city that was inaccessible to foreign observers. Between 1980 and 1986, Sakharov was kept under tight Soviet police surveillance. In his memoirs he mentions that their apartment in Gorky was repeatedly subjected to searches and heists. He remained isolated but unrepentant until December 1986 when he was allowed to return to Moscow as Soviet President Mikhail Gorbachev initiated the policies of perestroika and glasnost. In 1988 Sakharov was given the International Humanist Award by the International Humanist and Ethical Union. He helped to initiate the first independent legal political organizations and became prominent in the Soviet Union's growing political opposition. In March 1989, Sakharov was elected to the new parliament or Duma (from the Russian word for "thought"), the All-Union Congress of People's Deputies and co-led the democratic opposition. 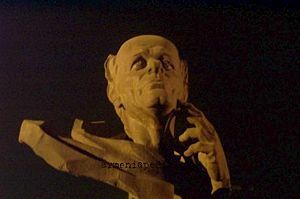 Sakharov died of a heart attack in 1989 at the age of 68, and was interred in the Vostryakovskoye Cemetery in Moscow. The Sakharov Prize, established in 1985 and awarded annually by the European Parliament for people and organizations dedicated to human rights and freedoms, was named in his honor. The Andrei Sakharov Archives and Human Rights Center, established at Brandeis University in 1993 are now housed at Harvard University. During the 1980s, the U.S. government named the street in front of what was then the main Soviet embassy building in Washington, D.C., "Andrei Sakharov Place" as a form of protest against his 1980 arrest and detention. This applied to the block of 16th Street N.W. between L and M streets. The new Russian embassy complex on Wisconsin Avenue was still under construction, as it would be for many years. “Andrey Dmitriyevich Sakharov.” Timeline of Nobel Prize winners. This page was last modified on 20 March 2016, at 19:08.